Oil at $1.50 a Barrel? Flint Hills Resources, LLC, a refiner owned by Charles and David Koch, offered to pay $1.50/bbl for North Dakota Sour crude, from the Bakken shale. Flint Hills originally posted a price of -$0.50/bbl (that’s right, minus fifty cents) for the sour crude, but later said that was a mistake and corrected the posting to $1.50. 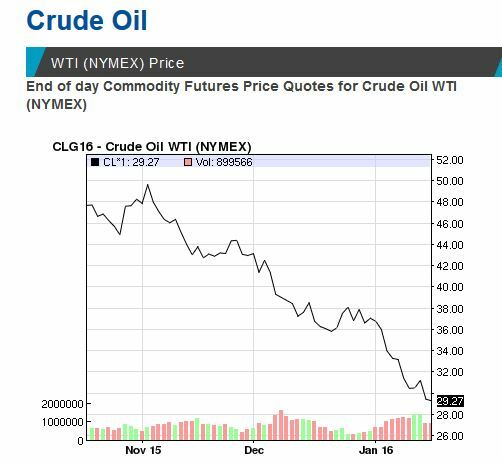 There is a lack of pipeline capacity for this ultra-low quality crude. Plains All American, another oil buyer, offered $13.25/bbl for South Texas Sour and $13.50 for Oklahoma Sour. West Texas Intermediate futures traded as low as $28.36/bbl in New York, and Brent Crude futures settled at $28.55/bbl in London.